Is it time to buy replacement cartridges for your swimming pool filter? Do you often have a lot of trouble figuring out the right size filter cartridges when it comes time to purchase them once again? Wouldn’t it be nice if you could find some great recommend dations for your filter’s size to cut down on all that annual shopping around? If you find yourself struggling with your pool filter replacements year after year, we’re here to help! In this article, you’ll learn everything you need to know about pool cartridge filter sizing. You’ll find out the proper way to measure your cartridge filter replacements so you never have to wonder if you’re buying the right size again. You’ll also find out information about each of the filter size types so you’ll know exactly what you’re working with. Following that, you can find several excellent product reviews for each type of filter size. When you’re ready to purchase new replacement filters for your pool, all you’ll need to do is check out our list of recommendations to help you get started. There are a lot of things to keep in mind when you’re shopping for replacement pool filter cartridges, but with our help, you can take care of this pre-summer chore quickly and easily. You’ll have your pool up and running with the right cartridge in no time. You might think measuring your pool filter is as easy as just figuring out the length and buying the cartridge that matches, but it’s not quite that simple. There are a few different types of pool filter sizes out there, and some of them are very similar to each other. Knowing your cartridge’s measurements can mean the difference between getting the right replacements on time and having to wait to send back an incorrect purchase. Follow the tips listed below to better understand how to measure your cartridge filter replacements. There are three measurements you’re going to need to focus on: length, outer diameter, and inner diameter. In some types of filters, the diameter measurements are only a fraction of an inch different, so it pays to pay close attention to what you’re doing when you measure them. To measure the length of the cartridge, measure from top to bottom including both end caps. If your filter cartridge is open in the center, try to measure it by running a tape measure through the center instead of measuring the outside. This can give you a more accurate measurement. To measure the outer diameter, measure the length across the top end cap. Be sure to take the lip of the end cap into consideration when you do this. To be sure your measurement is correct, double check it with the bottom end cap. To measure the inner diameter, repeat the process using the hole in the top end cap. You may find it easier to get this measurement with a ruler instead of with a softer device like a tape measure. Be sure to get the inner diameter measurement right for accurate filter sizing. If your cartridge doesn’t have an inner diameter (for example, if it doesn’t have a basket in the middle for chlorine tablets), then you don’t have to worry about that measurement. If both your bottom and top end caps are open, as they are with some cartridges, be sure to measure both inner diameters to be sure they match up. When measuring, be sure you don’t include any extra additions to the cartridge such as a handle. If you think you’ve found the right replacement cartridge size but it seems to be off by 1/16 of an inch or less, then don’t worry. You’ve still found the right type of cartridge, and it’s okay if the measurements fluctuate by this small of a number. Below, you’ll find information to help you better understand what you’re dealing with no matter what type of cartridge swimming pool filters you might have. There are generally five different types of filter sizes you’ll be facing with your pool products: A, B, C, D, and A/C. We’ve separated the sections below based on each of these sizes and we’ll give you all the information you need to understand what these letters mean for you. Once you’ve figured out which size filter you have, be sure to check out our reviews of the best pool filter cartridges by size for your pool listed under each section. The Type A cartridge filter for pool use is one of the most common on the market. If you have an Intex brand pool, you’re likely to have an A-type filter. These are long, tall cylindrical filter cartridge replacements that look very similar to the C and A/C types. This is because all three of these are usually interchangeable with each other, although sometimes they may need a slight adjustment to work universally. These filters are usually around 8”H x 7” D x 4.25” W. You can use these with just about any Intex above-ground pool filter as well as with any of the compatible models listed below. Are you looking for a filter cartridge set that will keep you supplied for months and maybe even years to come? Wouldn’t it be great if you could save some money on your filter cartridges without having to sacrifice quality at all? With the Intex ﻿﻿﻿Pool ﻿﻿﻿Easy Set Type A Replacement Filter Pump Cartridge 12-﻿﻿﻿﻿﻿﻿pack, you can get all that and a lot more. These cartridges feature a durable design and sturdy materials that will keep them operating well in your pool for weeks. Rinse them off or soak them in a cleaning solution and use them again and again to make this 12-pack last for a very long time. Since this is a 12-pack, it’s one of the best deals you can find on cartridge style filters. 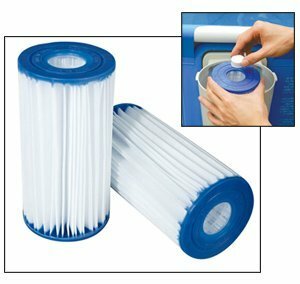 This is one of the highest-reviewed filter cartridge products you can purchase, and it remains one of the most popular choices for pool owners with A-type filters as well. These cartridges can stand up to long-term storage without damage or molding issues. These are universal cartridges that can be used with any A-type filter easily. To size this filter correctly, you may need to cut out the central ring inside each cartridge before placement. You cannot use these cartridges along with the type of chlorine tablets that must be placed inside the filter. If you have very hard water or do not clean and maintain your pool regularly, these cartridges may develop clogs quickly. The Intex Compatible Type A Pool Filter by OrcaFilters is a unique spin on the very common type A pool filter cartridge. With this powerful cartridge installed, you’ll never again have to worry about purchasing expensive replacements or worrying about safely disposing of your used and filthy cartridges. This filter features a removable and washable eco-friendly cover that wraps around a sturdy central casing. When in place, the filter works just like any other cartridge filter would, except that you won’t have to worry about throwing it away when it gets dirty. Just remove the outer wrap, wash it, and put it back in place for quick, easy, and environmentally safe pool operation. This filter is great at reducing the risk of algae growing in your swimming pool. ​You’ll be able to save a lot of money in the long run by purchasing this reusable filter. ​The casing is very sturdy and generally won’t become damaged or break very easily even with long-term use. You cannot use these cartridges with the chlorine tab placed inside because it could cause damage to the plastic housing over time. The filter media may not be as fine as it is in some pleated cartridges, so you may not be able to catch as many fine particles. It may be more difficult to put this filter together and in place than it is to replace disposable filters. 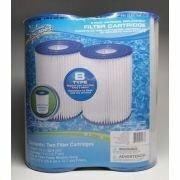 If you’re in search of an excellent pool filter set that can keep your water clean at a fraction of the cost of some of the others listed here, check out this Intex Easy Set Type A 29002E Replacement Filter Cartridge two-pack. This set of filters is designed for use with Intex brand swimming pools, but you can easily make them work with no trouble when you have any version of an A-type filter in place. Use them over and over again by rinsing off one and letting it dry while you install the other one in its place. With regular cleaning and maintenance, you can easily operate your filter throughout the whole pool season with just these two filters. ​Due to their long life, these filters are frequently purchased even by customers who live in warm climates and keep their pools up all year long. 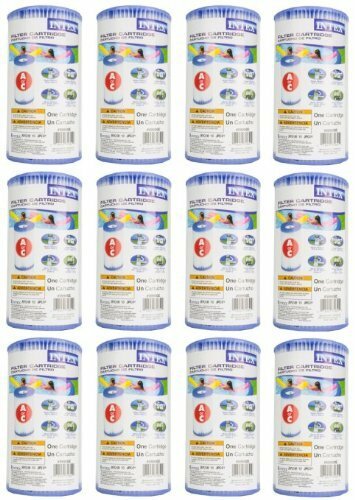 ​This is a very affordable pack of filter cartridges that won’t make a dent in your swimming pool budget. Although these filters are designed for use with the Intex line of pools, they are not made by Intex itself. You may need to rinse this filter every couple of days to keep it up and running without building up contaminants quickly. If you have very hard water, you may have more difficulty getting these cartridges clean than you would with other options. Type B filter cartridges are a little bit taller than Type A cartridges, but they’re a little squatter in shape overall. You can’t use them interchangeably with any other type of filter. These are still fairly common in the world of pool filters, but you’re a little bit less likely to have a B type filter than an A, C, or A/C. These cartridges come in at 10” H x 5.8” D x 5.8” W. They’re generally around the same weight as the other types of filters, but since they’re a little taller, you may end up paying a larger shipping charge for them depending on where you order them from. The No products found. comes in a handy six-pack that’s sure to keep you swimming in crystal clear water all summer long. This is a very popular product that many people with D-type filters come back to purchase over and over again. Since these cartridges come from the Intex company, you’ll be getting a great product with a lot of quality customer service and satisfaction to back up its name. You can’t go wrong when you bring home a set of these cartridges to help you clean up your pool and keep it running smoothly well into the future. Since these cartridges are made by Intex, they’re sure to fit just about any D-type filter perfectly without any trouble. ​Using these filters can help improve the flow rate for your pump significantly. ​These filters are made from heavier, sturdier fabric media than many of their competitors. You will need to clean these cartridges more frequently than you might need to clean other types. If you have hard water or a lot of fine sediment in your pool, these filters may not be strong enough to get the job done. These filters may be difficult to clean thoroughly and may add a little time to your maintenance every week or so. Clean up your water and experience the ease of quality cartridge maintenance when you purchase this two-pack of Summer Escapes B Cartridges for your pool filter. These cartridges are durable and long-lasting, and best of all, they feature extra pleating to provide you with a greater amount of filtration overall. Filters that have fewer pleats present aren’t able to catch as many sediments and fine contaminants as more heavily-pleated ones. With these cartridges, you’ll be getting a great filtration experience that you’re sure to enjoy. These are affordable cartridges that can be purchased in bulk to save you money. These cartridges last much longer than many of their competitors, and you probably won’t have to clean and alternate them more than once a month. The filter media fabric is much more sturdy in these filters than in many others available on the market. You will probably need to use an additional form of filtration or cleaning with these filters to get your pool totally spotless. You may notice these filters becoming damaged more frequently if you use them along with heavy pool treatment chemicals. Because of their finer pleating, these filters may be more difficult to rinse off thoroughly when it’s time to clean them. With the Bestway Pool Filter Pump Replacement Cartridge Type IV/B 6-pack, you’ll be well on your way to sparkling clean pool water as soon as you make your purchase. 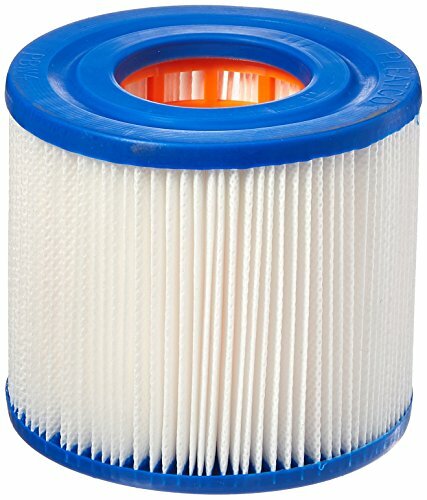 This type of cartridge filter is designed to last for several weeks before you’ll need to clean and replace it. When you have so many cartridges to help you get started, you’re sure to make it easily through this year’s pool season and maybe even the next before you’ll ever have to worry about buying more filter media again! Bring home your set today and get ready to experience truly clean swimming pool water. These filters are designed for regular cleaning and reuse, so you won’t run the risk of damaging them from soaking and rinsing often. These cartridges are easy to replace when the time comes without the need for any special tools or experience. You can use these cartridges along with a skimmer or with any pool treatment chemicals you like. In some instances, the paper filter media has been known to tear quickly, usually when the filter has been in place too long. There is no reinforced stitching to keep the filter media in place like there is with some other cartridges. These cartridges may be a little more flimsy overall than some of the others listed here. Like the Type A filter cartridge, Type C filters are usually fairly universal in their design. If you have a pop-up pool in your backyard, chances are good you’ve got a Type C filter to contend with. Many of these filters can be used with Intex pools, but not all of them can. Although they’re generally considered interchangeable with A types, it’s important to note that these filters are actually very slightly smaller, coming in at 8” H x 7” D x 4.13” W.
Whether you have an Intex pool filter or you’re just looking for a great universal C-type cartridge that will work no matter what brand you’re using, this No products found. filter is ready and waiting to help you get your water clean. This is a strong and sturdy filter cartridge that’s built by the Intex company, which is one of the most recognized brand names in the cartridge world. If you’re in search of a great cartridge that will give you many months of use with only simple regular cleaning and maintenance, look no further. You can easily use this cartridge along with any type of pool treatment chemicals with no risk of damage. The filter includes lots of pleats to increase the amount of filtration you get with your water. You can use this cartridge with any C-type filter without having to worry about making it fit or adjusting it in any way. This product is a little bit more expensive than the other C-type options listed here. In some instances, the pleats have been known to pull free from the plastic casing on the filter after just a few uses. This cartridge may have trouble handling very hard water or very frequent pool use. 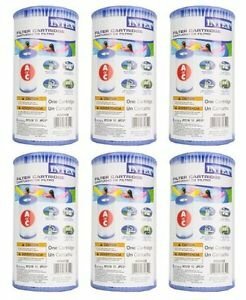 This Type C Replacement Pool Filter Cartridge – 4 Pack is a great solution for pool owners looking to stock up on excellent, high-quality filters without having to spend too much money to do it. These cartridges are sturdy and designed well, and best of all, they’re built to fit your filter with no alterations necessary. Although they aren’t produced by one of the big names in the cartridge filter industry, you can rest assured that you’re going to get a great set of products that will keep your pool water clean and refreshing when you bring home this product. This is a very affordable product that can allow you to stock up easily and keep your pool supplied with filters all season. These filters are capable of cleaning up your pool overnight when you install them. 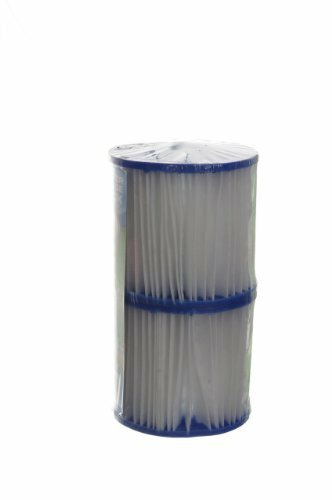 With extra pleats in place, this cartridge can clean up your pool water much more efficiently than many other filter cartridges on the market. In some rare cases, the plastic portion of this cartridge has been known to arrive broken or cracked. This filter doesn’t come from a popular brand name, so it may be less desirable for some pool owners. The filter cartridge doesn’t feature reinforced stringing to keep the pleats in place like some other models do. 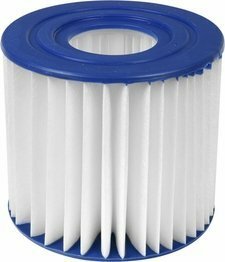 The Blue Wave NFC230-4 4-Pack Type C Filter Cartridge is designed for use with the Intex ProSeries pools, but you can easily get a lot of great use out of it in any C-type filter. These cartridges are heavy-duty and built to withstand a lot of use and cleaning, which makes them a great way for you to buy in bulk and save some money in the long run. They are very easy to remove, replace, and clean when the time comes, which makes them an even better choice for anyone looking to save a little time and effort when it comes to swimming pool maintenance. These cartridges come with a basket for your chlorine tablet, which makes chemically treating your pool much easier. The cartridges feature extra pleating to help give you more filtration area and a better, cleaner pool experience all summer long. It’s easy to use these filter cartridges in any C-type filter without needing to make adjustments or use force to get them in place. This pack of filters is very expensive and may be over your regular filter spending budget. Since some pool owners like to buy from popular brand names, these cartridges may not fit this specification. These cartridges will need to be cleaned and replaced every couple of weeks instead of every month. Although the Type D filter for swimming pool use is easily the least common type of pool filter, you still may have one sitting in your backyard right now. If so, you’re probably wondering where to find replacements for it, since they’re getting harder and harder to come by. These are short, squat filter cartridges that are much smaller than all of the other types. They measure around 3.75” H x 2” D x 4.25” W and are often available as a set, but not always. They can be used with a few Intex brand pools as well as several of the Summer Escapes and Summer Waves swimming pool line. For an excellent all-around pool filter type D that’s sure to work well with your above-ground or pop-up pool’s cartridge filter, look no further than this Sand ‘N Sun Pool Type D Filter Cartridge. This cartridge, made by the well-known Intex company, provides you an excellent option when you’re looking for filter media you can rinse and reuse several times throughout your pool season. Best of all, since it’s built to fit D-type pool filters, you’ll be able to use it even with this hard-to-find size. Bring home a set of these cartridges to make the most of your swimming pool. 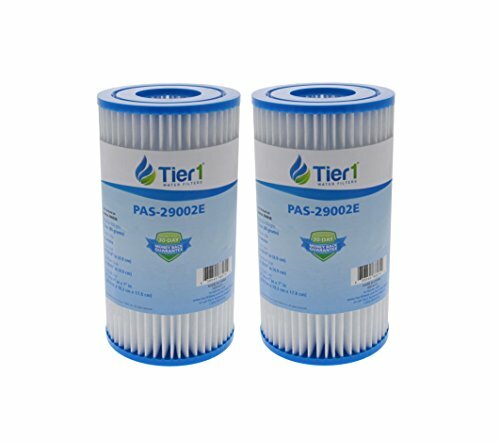 This filter cartridge has plenty of pleats to help you catch even fine pieces of dirt and sediment in your pool. The cartridge is made from durable plastic and fabric that can withstand several uses before they’re likely to become damaged. Proper storage during the off-season will keep these filter cartridges in great condition and ready for next year’s pool months. This filter is much more expensive than some of the others listed here. The cartridge doesn’t have a chlorine tablet holder, which can be troublesome for some pool owners. You may need to replace this filter every three weeks as opposed to every month. 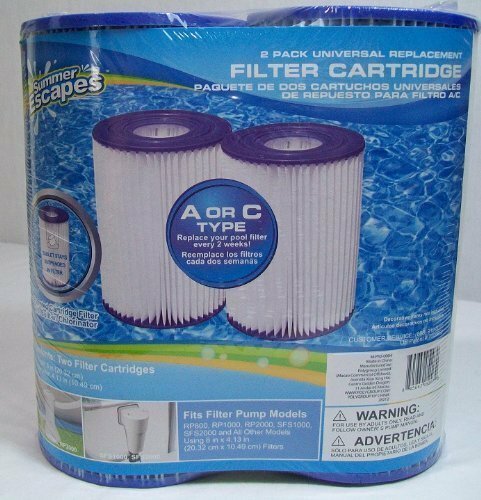 When you’re looking for a durable size D pool filter cartridge that’s sure to last you longer than its competitors, give this Type D Pool Filter Cartridges 2-Pack by Summer Escapes a try. These filters are designed to fit your pool filter easily, and since they’re built from durable materials, you won’t have to worry about a lot of potential damage or breakage during use. Best of all, they’re some of the most affordable D-size filter cartridges you can find. If you’re hoping to save a lot of money on your filter spending while still getting a great product for your pool, look no further than this excellent cartridge. These filters can stand up to a lot of cleaning and rinsing before they start to show signs of wear and tear. These cartridges have a central basket for holding your chlorine tab. You should have no trouble getting these cartridges to fit in your filter as long as it’s a D-type. You may need to alternate these filters more frequently than you would with some of the others listed here. These filters don’t have as many pleats as some of the others listed here, so they may not work as well for very fine dirt and debris. You may have difficulty using these cartridges if you have very hard water. Although the Pleatco PB4PAIR Replacement Cartridge is designed to replace the filter in the Intex Sand ‘N Sun swimming pool, you can easily use it in any type of filter that requires a D-type filter. This is a harder to find filter size, but with this product, you’ll be able to bring home a two-pack of quality filters that will help you keep your pool operating cleanly and comfortably for many months to come. This filter cartridge is built of sturdy materials that are designed to stand up to use even in chemically treated swimming pool water. Try out a Pleatco cartridge in your pool and get ready for safe swimming! There are a lot of pleats present in each of these filters, which gives you extra filtration area and improves the cleanliness of your pool. It’s very easy to keep these filters clean so you can replace and reuse them over and over again to save money. The filters come wrapped for easy storage even in the long-term. These filters don’t come with a basket holder for your chlorine tab, so you’ll need to use a different type of pool chlorinator if you choose them. Although they are built for D-size filters, these cartridges may be difficult to fit on certain models of filters without some effort. The paper filter media may become damaged and torn easily in these cartridges. Last but not least, the A/C type filter cartridge is the most universal and the most common as well. These cartridges are designed for use with both the A and the C-type filter interchangeably since their measurements are only slightly different. Most of the time, these cartridges are designed with two central diameter rings that can be punched or cut out to fit the right type of filter. In some instances, however, they’re designed to fit snugly on either an A or a C filter without the need for any alterations. If you have an A/C compatible pool filter, you should have no trouble finding replacement cartridges just about anywhere. 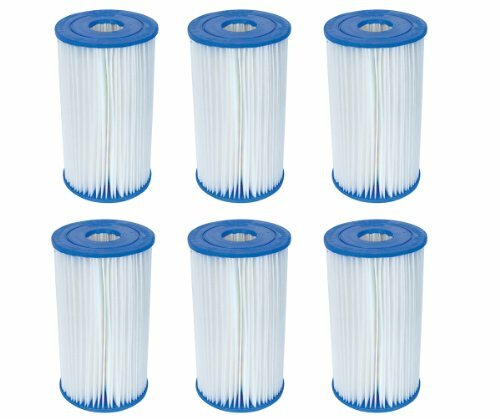 The Intex 29000E/59900E Easy Set Pool Replacement Filter Cartridge is available in a pack of six to make your life easier and keep your pool cleaner for a much longer period of time. This popular product is arguably the most frequently purchased A/C type swimming pool filter, so you know you can’t go wrong choosing a product that so many other people have come back to time and time again. This filter cartridge is made by the Intex company, and they bring their usual commitment to quality and excellence to this filter media. You’re sure to be pleased with the clean water you’ll get when you use these cartridges. These filters are usually capable of filtering out much finer dirt and debris than many of the other cartridge filters on the market. You’re sure to get plenty of time out of this pack of filters when you clean them regularly and reuse them several times. This cartridge is very easy to install and replace with almost no trouble when the time comes. In some instances, these filters may cause your pool filter to develop leaks when they become too backed up with contaminants to work correctly. This filter cartridge doesn’t come with a basket for a chlorine tab, which will limit your options when it comes to chlorinating your pool. You may notice these filters becoming damaged more easily when you use a lot of treatment chemicals in your pool. 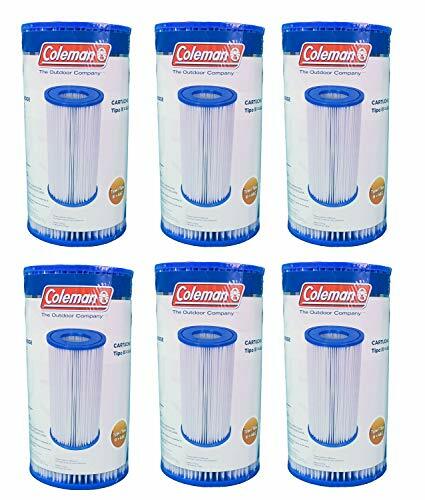 When you want to get your pool cleaned the right way every time, look for these Coleman Type III A/C Pool Filter Pump Replacement Cartridge filters. Available in a pack of six for a very affordable cost, these filters can help you provide fresh, clean water in your swimming pool all summer long, or even all year long, depending on where you live. Although they’re designed specifically for use with Coleman brand pools, they are A/C type filters, so you can easily use them in any compatible pool pump and filter system you might have installed. These filters are made by a well-known brand name, which is a bonus for anyone looking to buy only brand name pool products. 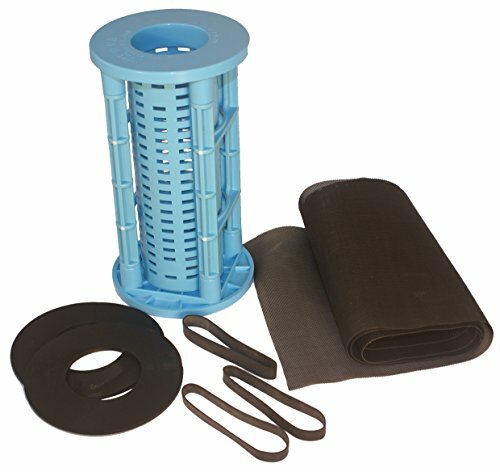 These filters are sure to keep the water flow strong and steady for much longer than many other cartridge filters on the market. You can get a lot more life out of these filters by cleaning them and reusing them several times before discarding them. These filters may need to be changed every three weeks as opposed to every month, especially when you regularly use your swimming pool. If you have an older pool filter model, you may have trouble getting these filters to fit. The filters may require some slight adjustment to get them in place, especially the first time you use them. This two-pack of Universal Replacement Filter Cartridges is the perfect option when you’re looking for a great A/C type cartridge that will work perfectly with your 8x4.13” filter. This is a very low-cost set of cartridge replacements that’s nevertheless built to last just as well as some of the pricier ones listed here. These filters are very popular, and when you purchase a pack of them, you’ll soon see for yourself what keeps pool owners coming back to this type of cartridge time and time again. You can easily wash these filters and use them several times before you’ll need to completely replace them. The filters include a basket for your chlorine tab to make treating and shocking your pool even easier. These filters are made from durable materials that can stand up to a heavily-treated pool if necessary. Depending on your pump, these cartridges may be slightly too small and could require a bit of force to put them in place, which runs the risk of damaging your pump. These filters don’t have the long-lasting staying power that some of the others listed here have, and you may need to clean them much more frequently. These filters may not be strong enough to handle very hard water. Determining the type of filter you have is just the first step toward choosing and purchasing the correct replacement cartridges. Although it may seem like a little bit of a challenge to figure all this out, don’t worry. If you happen to have your filter’s instruction manual handy or your filter tank has the model and brand name printed somewhere on it, you can easily look up this information and keep it handy for the next time you need to order replacements. If you don’t have access to your filter’s info that easily, it’s okay. Just remember the tips in the first part of this article that can help you measure the cartridge and find the right fit for next time. When you’ve determined the type of filter you have, you’ll be able to narrow down your choices for the best replacement cartridges easily. No matter which one of the products listed above you end up choosing, you’ll be able to benefit immediately from their great quality and high standards. You’re sure to have a lot of relaxing days by the pool knowing you don’t have to worry about what’s keeping your water clean!